Observations: Yes, the campaign was wild and crazy, and the aftermath is, too! Yes, the campaign was wild and crazy, and the aftermath is, too! 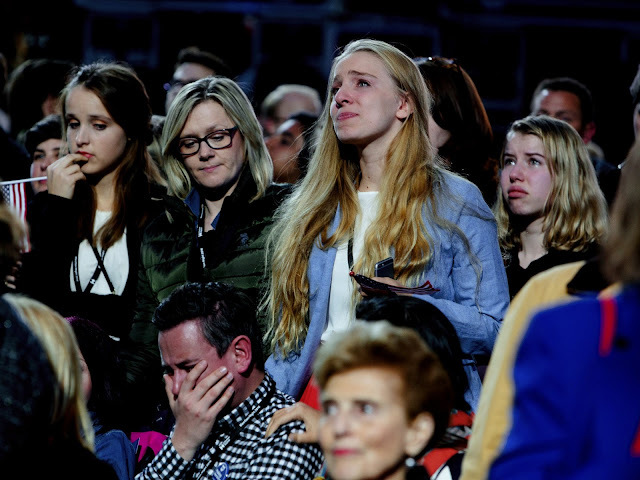 The election of Donald Trump on November 8 set off waves of emotion, both positive and negative. Usually, such feelings wane and normalcy returns after several days, but three weeks later much of the negativism remains, and may have intensified. Some of the reactions to the election strike many as farcical, even phantasmagoric. Many of the reactions strike directly at the very traditions and history of America and its people. Unsurprisingly, much of the craziest stuff arises on college campuses. You see, some view the flag at the center of the Hampshire College campus as a symbol of racism and hatred, and following the election, some students called for its removal. The flag was pulled down and burned early one morning, and quickly replaced. But then the College Board decided the flag would be flown at half-staff, a decision that angered veterans and military families. The solution, the College decided, was to take the campus flag down until next semester, but not to ban all flags on the campus. ** Among the nation’s highly respected institutions of higher learning is the University of Virginia (UVA), founded nearly 200 years ago by Thomas Jefferson, author of the Declaration of Independence and third President of the United States. After UVA President Teresa Sullivan quoted Jefferson in a campus-wide email encouraging students to stay resilient and hopeful while trying to recover from the distress suffered after the election, some students and faculty objected to the Jefferson quote. One might expect students and faculty at an institution of higher learning to be capable of appreciating that a positive message including a quote from the school’s famous founder is not necessarily rendered meaningless by the fact that Jefferson owned slaves. Such efforts by the easily offended on the left to erase elements of the nation’s history they don’t like in order to create the pretty and clean image that matches their fantasy is fundamentally dishonest. While much of this activity has taken place on college campuses, it seems this craziness exists elsewhere in the U.S.
** An anti-Trump organization named “The #NotMyPresident Alliance” has exposed electors of the Electoral College to the whims of people who don’t want Trump to win the Electoral College vote by releasing personal information on the electors, including the personal phone numbers, addresses, religions, races, genders, and candidate preference of the electors. According to Buzzfeed.com, “The group hopes that its members and citizens around the country will contact electors and persuade them to change their vote from Donald Trump to another candidate before Dec. 19” when electors meet to cast their votes. One wonders how many electors will be threatened by Trump opponents? ** Here’s an item that might produce cries of “Yes! Go for it!” People in the Golden State are calling for secession. "The relationship between California and the federal system just isn't working," said one of those leading the protest, complaining that federal tax money paid by Californians “isn't adequately supporting aging infrastructure and public programs in the state.” He and a small group paced in front of the state capitol, chanting, "What do we want? Calexit! When do we want it? Now!" Amid signs proclaiming "Free Hugs" and "Not my president," and some profane Trump chants, he said Trump’s election proves that America is failing. “So then the question becomes, do you want to go down with the sinking ship, knowing that you have a ship that's able to sail the international economy on its own?" California dreaming is alive and well. Why would anyone think it’s acceptable to hire people who broke the law when they came here to serve as law enforcement officers? It is not discrimination to exclude illegals and criminals from these jobs; it is common sense. America is not about the majority bowing down to a minority who want to change long-standing traditions and practices they don’t like. We can’t allow ignorance and emotion to rule. We just celebrated Thanksgiving, expressing our gratitude for the blessings we now have. Looking to next Thanksgiving, perhaps these misguided Americans will have realized that these things and the thoughts behind them are not what America is all about.